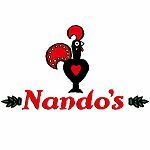 Nandos is a well-loved restaurant chain that specialises in superb chicken dishes and their famous Peri-Peri sauce. Nandos does quick comfort food with a finesse that many other fast food restaurants just can’t compete with. And the prices aren’t bad, either. Nandos Streatham’s proximity to the Odeon Cinema makes it a very popular pre-movie spot. And it’s certainly enticing with a pretty cream exterior, plants out the front, large windows and the bold red Nandos branding. Spanning an entire street corner, it’s also more than well equipped to deal with the peak time rush. Inside, the decor is typical of the chain with cream and terracotta walls covered in bold prints. Heavy wooden tables and chairs are well packed in to ensure as many people can be crammed into place as possible without making things uncomfortable and there’s a counter area where you order the food. Nandos Streatham can be pretty manic on a Friday or Saturday night, especially around movie time at the nearby Odeon. Having to queue and order your food at the counter yourself can be irritating when busy as you can start to feel like you’re in a KFC instead of a Portuguese chicken restaurant. Still, the staff are good humoured and friendly, with waiters taking drinks orders and trying to be as helpful as they can. If only they’d only take your food order. Nandos menu is fun and it allows you to put your own spin on each dish. First, you choose your chicken (it’s all about the Peri Peri chicken here – why order a burger or a wrap when you can get them in almost every bar and pub across London?). The fresh chicken has been marinated for 24 hours in an Afro-Portuguese Peri Peri sauce before being flame grilled, and the choice includes a quarter, half or whole chicken or chicken wings. You then choose just how hot you want it. The selection covers everything from medium to extra hot with a lemon and herb or mango and lime choice for those with a more delicate palate. And the chicken is delicious. 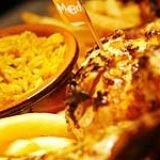 Moist, well cooked and packed full of flavour, Nandos is pretty good at pretty much always hitting the mark. And with prices between £3-£8 (just under £12 for a whole chicken) or a bit more for a meal with sides, it’s very affordable. A side of chips with Peri Peri salt brings it together nicely as does a rich, creamy mashed potato. Otherwise, coleslaw, corn on the cob and garlic bread all help to inexpensively bulk out the meal. The wine selection - with bottles priced at less than £20 - is well matched to the food, with a choice of Portuguese and South African bottles available. Otherwise, there’s a good selection of beer with Sagres, Superbock, Brahma and Savanna cider available in bottles. If, however, you’re going teetotal or just fancy a soft drink then their very well priced Coke, Fanta or Sprite (£2.14) are bottomless, so you can request as many refills as you want. And that might be quite a few if you’ve opted for extra hot Peri Peri chicken. Nandos has taken fast food to the next level and it’s easy to see why the Streatham branch has proven such a hit with locals.